It's early July and apart from the occasional arrest, the NFL offseason is deadly quiet. So, why not bring up a 2005 playoff game? Late Monday evening, Twitter user @jbott32 exchanged tweets with former Denver Broncos center Tom Nalen, discussing, among other things, the "Patriot Way" and SpyGate. @jbott32 i swear they taped our practices prior to the playoff game in the '05 season. When asked to expound, Nalen added, "We came out with the funkiest splits along the offensive line and New England adjusted to it in seconds." It's a bold accusation, but Nalen has never been accused as being afraid to speak his mind. After being inducted into the team's Ring of Fame in May, Nalen admitted in his press conference that he wanted to intentionally hurt former San Diego Chargers' defensive lineman Igor Olshansky back in 2006. Nalen, who now co-hosts his own radio show on 102.3 FM ESPN Denver, received a lot of flak for making the above statement, but if they are pressed to be honest, countless other players would likely reveal similar stories. In regards to the playoff game in question, the Broncos won, 27-13—Nalen says it was "closer than that," presumably meaning that the final score did not accurately depict how evenly matched the two teams were. 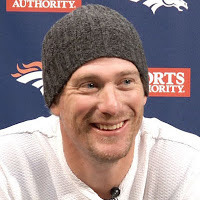 If New England did spy on the Broncos prior to the game, it ultimately didn't help enough, as Denver claimed a two-score victory. The Broncos went on to play (and fall) to the Pittsburgh Steelers, 34-17 the next week in the AFC Championship round of the 2006 playoffs (following the 2005 season). The Broncos will play the Patriots in Week 12 this season at Gillette Stadium on Sunday Night Football on November 24.